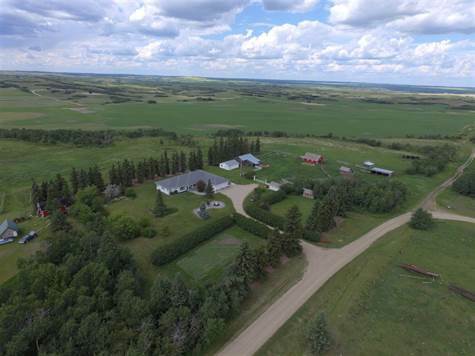 Garage: Double, Attached "26 x 26 plus 9'5" x 10' Mudroom"
Basement: Yes, Full "Fully Finished"
Upscale living in this scenic 51 acre property located 22 km northwest of Neilburg, Sk. With over 4,200 sq ft of living space in the modern bungalow, this beautifully treed and landscaped property features outbuildings and land suitable for a small livestock or equine facility. - Built in 2004, this 2,616 sqft bungalow features a 5 bedroom 4 bath layout including a finished basement. - The main floor features a spacious and conveniently laid out kitchen including double wall oven, eating island with wooden baker’s counter, built-in china cabinet, walk in pantry, and an abundance of storage! - Adjacent to the kitchen is the breakfast nook and family room with access to the wrap around 12ft x 28ft north facing covered deck and 12ft x 24ft west facing deck. The other side of the kitchen leads to the formal dining room and a formal living room. - The Master Bedroom has a large walk-in closet and 4 piece ensuite with jetted corner tub with stand alone shower. Down the hall you find the 4 piece main bathroom, den, large bedroom, and main floor laundry/sewing room/office. - Completing the main floor is a 2 piece bathroom and mudroom, leading to the 26ft x 26ft double car heated garage, with bonus storage room. - The basement features a large L shaped family room, 3 additional bedrooms each with extra deep closets, a 4 piece bathroom, den with double closets, storage room with shelving, cold room, and the utility room. - Heat for the main floor is via forced air natural gas furnace, while domestic hot water and in-floor heat for the basement and garage is supplied by the natural gas fired boiler. - Garage: 24ft x 28ft detached insulated garage/workshop with single overhead door, concrete floor, 2 steel workbenches with drawer storage. 100 amkp service with welding plug. - Pole Shed: 24ft x 36ft x 12ft high with sliding doors, metal roof, and dirt floor. - Barn: 28ft x 32ft 8 stall barn with concrete floor and hay loft. - 12ft x 24ft 4 season cabin with kitchen, bathroom, and left area with bedroom. - Water supply is a well, septic is a lagoon located west of the house. From Neilburg: 9 miles north on HWY 675, 4 miles west, 1 mile north.